Published in 1977, Sadako and the Thousand Paper Cranes has inspired millions of children to want to learn more about Japanese culture and the art of paper folding. Sadako and the Thousand Paper Cranes is a work of historical fiction based on the life of a real girl who fell ill with leukemia caused by radiation from the atomic bombing of Hirsohima by the United States. 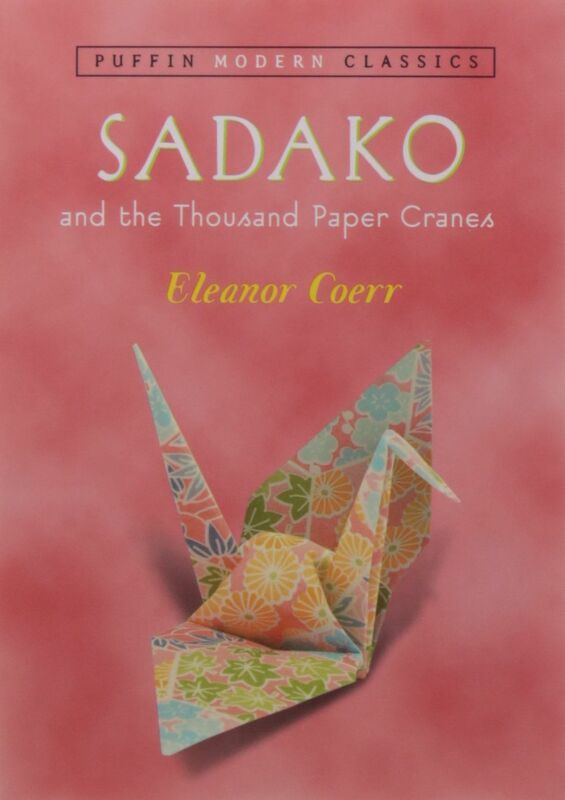 Author Eleanor Coerr first learned about Sadako Sasaki when she traveled to Japan in 1949. A missionary gave her a copy of Sadako's autobiography, Kokeshi. This was the basis for Coerr's writing. The book is written to be of interest to children in grades three to five. It is a work of historical fiction that deals with Japanese culture, the World WWII aftermath, and the role of arts and crafts in helping people cope with stressful situations. Chapter 1–Good Luck Signs: Sadakao is excited to go to the Peace Day celebration. Her mother reminds her that the day is about remembering the people who lost their lives when the bomb was dropped on Hiroshima, including Sadako's grandmother. Chapter 2–Peace Day: Sadako meets up with her friend Chizuko. The girls enjoy eating cotton candy and looking at all of the pretty things the vendors have for visitors to buy, but looking at the scarred faces of the bomb victims makes Sadako uncomfortable. Chapter 3–Sadako's Secret: Sadako helps her team win a big race on Field Day, but suffers from an unexplained dizzy spell she keeps a secret. The dizziness continues as she is training to make the relay team in junior high. Chapter 4–A Secret No Longer: Sadako becomes dizzy and falls down in class. She is taken to the hospital and diagnosed with leukemia. Chapter 5–The Golden Crane: Chizuko is Sadako's first visitor in the hospital. She brings golden origami paper and encourages Sadako to ​fold cranes by telling her the legend of the 1,000 paper cranes. The girls decide that folding cranes may help Sadako get well again. Sadako completes her first 12 cranes. Chapter 6–Kenji: All of Sadako's family, friends, and classmates are saving paper for her project. She meets a boy named Kenji who also has leukemia. They become friends, but he soon passes away. Sadako has now folded 464 cranes. Chapter 7–Hundreds of Wishes: Leukemia makes Sadako feel tired all the time. Her mother and brother bring Sadako her favorite foods and try to cheer her up. Sadako has now completed 541 cranes. Chapter 8–Last Days: Sadako gets to go home to visit her family for O Bon, a holiday celebrating the spirits of the dead who have returned to visit the people they loved on Earth. She enjoys seeing her family and her friend Chizuko but is very weak. Her mother gives her a kimono and she folds paper crane number 644. It is the last crane she is able to make. Chapter 9–Racing with the Wind: Sadako is too weak to fold cranes, but is surrounded by her family. She passes away on October 25, 1955. Epilogue: Sadako's classmates fold the remaining 356 origami cranes so that 1,000 paper cranes are buried with her. Throughout the world, young Sadako becomes a symbol of peace. How would you describe Sadako? Sadako was only two when the atomic bomb was dropped near her home by Misasa Bridge in Hiroshima, Japan. Were you surprised to learn that people in Japan continued to get sick many years after the bomb had been dropped? Was it right or wrong that Sadako tried to keep her dizzy spells from her parents? Why? Why did Chizuko tell Sadako the story about the cranes if she did not believe in good luck charms? Sadako said that folding cranes gave her hope that she might get better. What gives you hope when you are faced with a challenge? Why was it important to Sadako's mother that she have a kimono of her own? There is a bilingual English-and-French film based on Sadako and the Thousand Cranes that was released in 1991. It was narrated by Liv Ullman featuring guitar music performed by George Winston and the soft pastel illustrations of Caldecott Medalist and children's author Ed Young. The film was only 30 minutes long and is not widely available to the general public. Weston Woods has the DVD available for purchase for librarians, however. There have been many tributes to the memory of Sadako over the years, but the best-known memorial to this brave young girl was created in 1958. There is a statue in memory of Sadako Sasaki at the Hiroshima Memorial Peace Park in Naka-ku, Hiroshima, Japan. Sadako is holding a golden crane and there is a plaque with an inscription that says, "This is our cry. This is our prayer. Building peace in the world." 1,000 Paper Cranes: Why Make a Senbazuru?